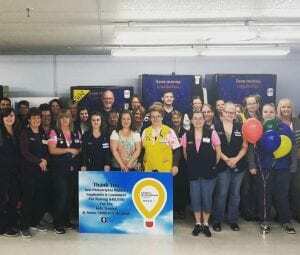 Walmart and Sam’s Club associates, customers and members in the Akron area put their money where the miracles are during the annual Children’s Miracle Network Hospitals fundraising campaign. Donations poured in Aug. 27 to October 7, as Walmart and Sam’s Club associates at Akron area locations held various in-store fundraising activities and asked customers and members at the register to help kids live better. Customers at 25 locations across Northeast Ohio made $1, $2 or $5 donations at the register when completing a purchase. For a $5 donation, customers received a reusable, insulated, zippered tote featuring the Akron Children’s and CMN logos. The Akron area Walmart and Sam’s Club stores raised $237,443 for Akron Children’s Hospital. The effort was part of a national campaign for Children’s Miracle Network Hospitals which resulted in $36,514,895 million raised, putting the total raised in the U.S. and Canada since 1987 over the $1 billion mark. The New Philadelphia Walmart raised more than $40,000 with its campaign this year, the most of any store in the area and $18,000 more than it raised last year. The New Philadelphia store also ended the campaign sixth in the nation for amount of money raised. Thank you to all 25 Walmart and Sam’s Club locations for a stellar campaign year! Previous post: Miracle Monday: Play Games, Heal Kids!